I am sorry to write such a direct post about my town, but I have being blogging on this subject for 18 months and during that time have had numerous conversations with just about everyone in authority locally, including the police, Councillors, council officers and my MP and absolutely nothing appears to have changed, if anything, a minority of motorists are getting even bolder and are parking further onto the pavement. During this time I have also become aware of the sheer number of different obstacles encountered in a small area. Do remember however that all is not lost, far from it. We are getting on the case and our job is to keep highlighting the issue in a way that the authorities can not keep ignoring and one day someone who is in a senior authority position will finally get enough courage and confidence to grab the issue and deal with it effectively. There are many examples of where issues have suddenly been addressed after years of neglect. I believe that for years the French authorities accepted much higher levels of road deaths than occurred in the UK, until the son of the minister of transport? was killed in a traffic collision, Since that event the authorities have been having considerable success with a campaign to bring the figures down (I can’t now find a reference to this – can anyone confirm it). The French are currently introducing numerous additional road safety initiatives and produce particularly hard hitting information campaigns. It is also encouraging how cyclist safety has finally been getting very powerful media support from new sources, notably from The Times. The next step for this campaign might be when a major national newspaper to takes up the pedestrian cause in a big way with clear campaign demands. Until something changes we need to continue to bring pressure and information to those in power who will one day realise that they just have to address it and that there is considerable support from people to address it. Until then I will continue to draw attention to the issue. To that end, here are a few examples of what pedestrians around my area have had to put up over the past 48 hours! 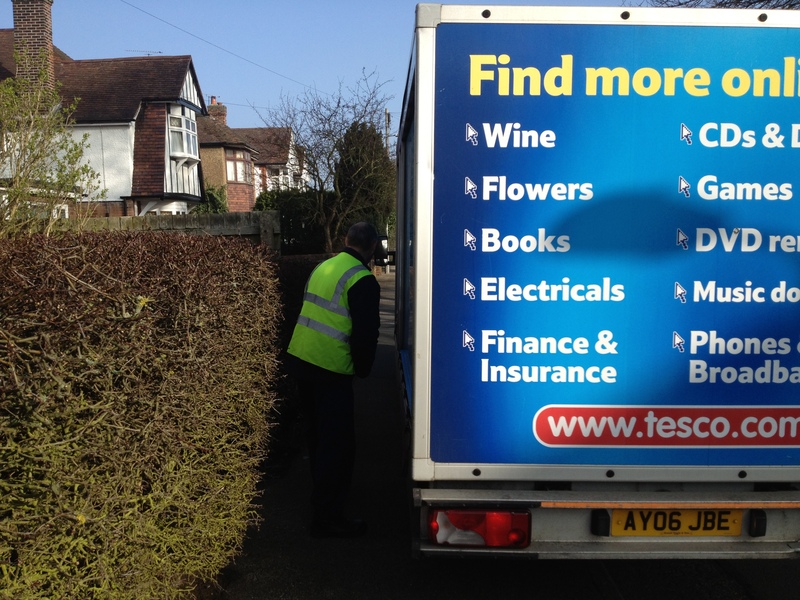 First off, there is the Tesco delivery truck this morning. The driver said that he had received no guidance at all on where it was acceptable to park and where it wasn’t (not that I believe that really, possibly it is more a matter of ‘don’t ask, don’t tell‘). The driver was parked so far up onto the pavement today that I could hardly get past at all without being scratched by the prickly hedge; the local guy in his wheel-chair would have no chance. As usual there was a space for the driver to park on the other side of the road, but that would have increased his drop-off time by, ohhh, possibly at least a minute and we all know that for Tesco ‘every penny counts’! 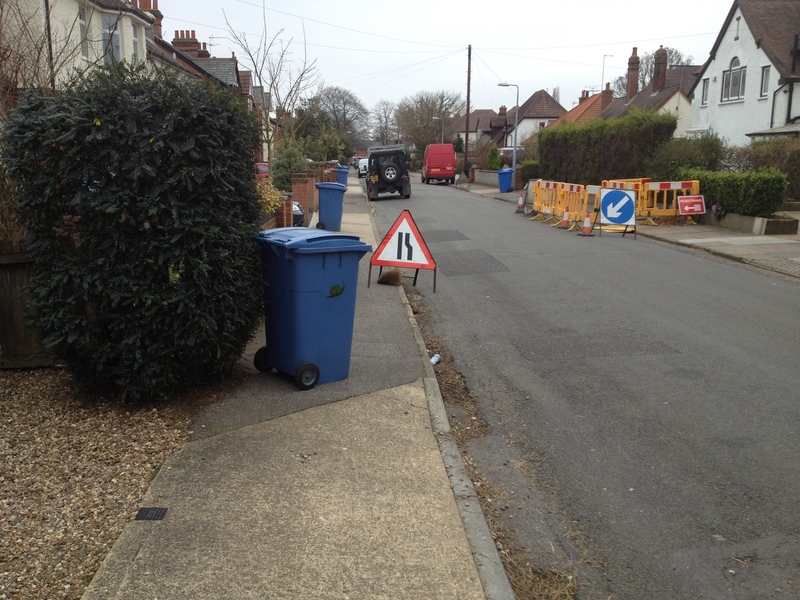 Next up, we have a delightful combination of bin day and road works. The road signs from May Guerney do at least leave the legally required 1m clearance this time, but unfortunately they create a chicane for pedestrians when combined with the bins that have been left scattered as usual across the pavement by the council making it impossible for my wheelchair-bound neighbour to use the pavement. Possibly he should just stay at home on bin-day? Or possibly the council should instruct their staff to return bins onto drive-ways where they are available and road-works signs should only be used where they are actually required for safety reasons! Bin day and road works. No chance after council have littered pavements with bins! So now we move the the next street where the bin collectors have left the bins neatly scattered across the pavement next to the cars which was also oh-so-elegantly up on the pavement making the pavement completely unusable. The bin-collector I spoke to was unapologetic and indicate that he was completely happy with how they had been left. His parting comment was ‘it is a kerb-side collection, not a garden collection’ which was clever of him! As regular readers will know I have been banging on to the local council about their bin collection policies for months now with no apparent effect. 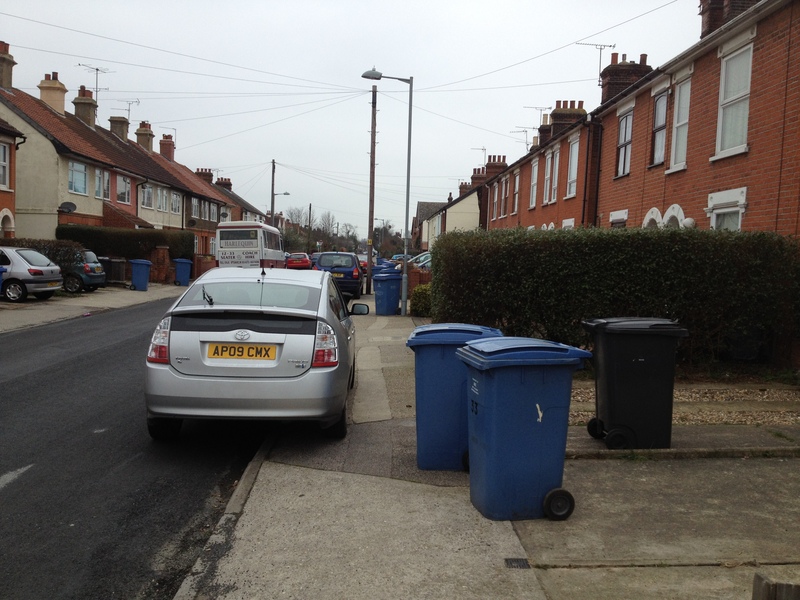 Bins left on pavement by council and cars on pavement. No chance! Finally, we have a new ‘dropped pavement’ being constructed nearby. The council refer to them as ‘dropped kerbs’, but using the current design they lower the pavement on a slope across the whole width of the pavement. 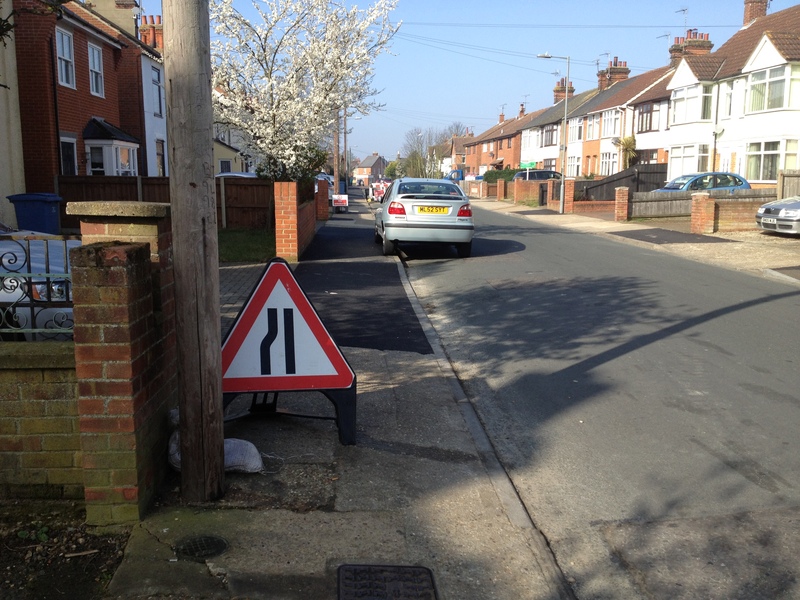 I have previously requested that they keep the majority of the pavement level as they used to in the past. 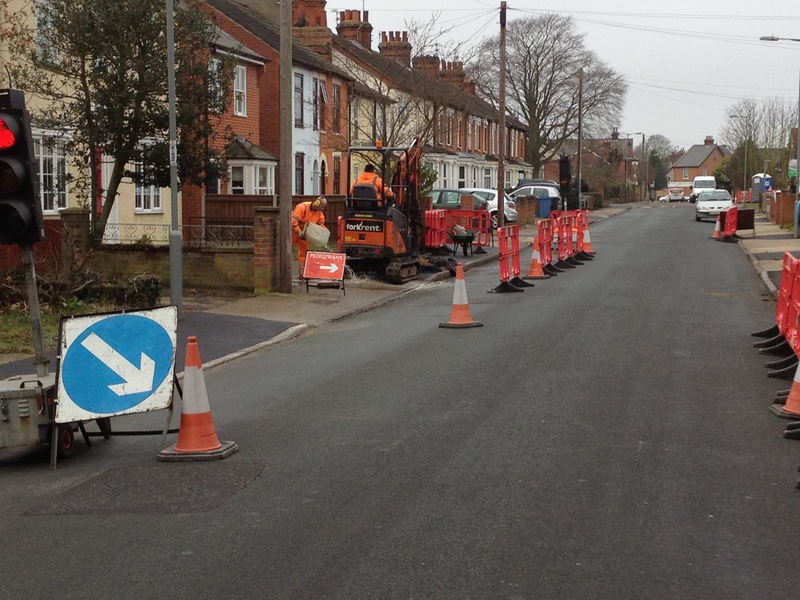 A new dropped-pavement being constructed – more sloping pavement to deal with. And here is the result. 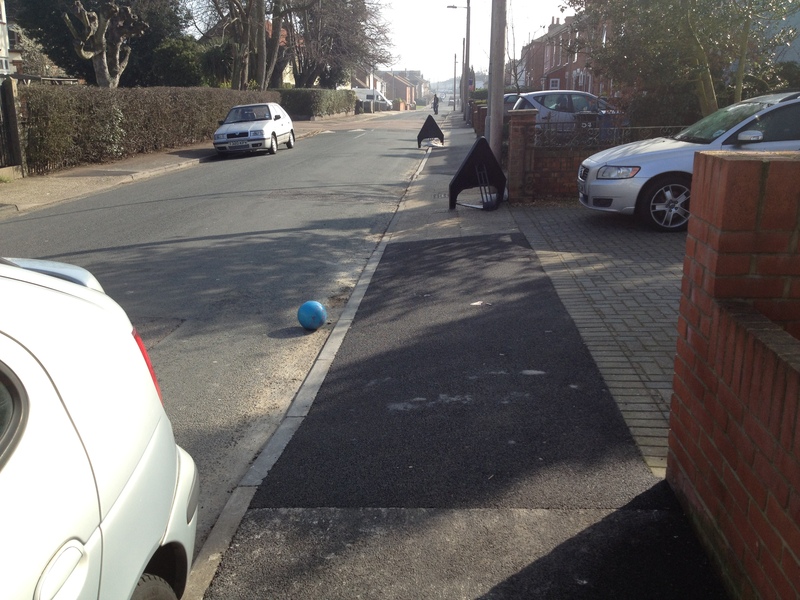 And to illustrate the slope, I place the football at the curtilage (where the pavement joins the property) and watched it roll across the ‘pavement’ into the carriageway before settling in the gutter. Not helpful for wheelchair and buggy users. Do also notice the road-works sign (see below). Finally, just past this dropped kerb I came across a road-works sign left illegally with less than legal minimum 1m space required for pedestrians. Given that I had discussed this issue with the person from the Nation Grid Gas only yesterday, and given that the road-works were highly visible, I have now removed the sign into safe keeping joining the sign from Mervyn Lambert which has still not been collected incidentally. As usual I will now email their marketing people and let them know that they can come and collect it from me. Almost at the exact moment that I pressed ‘post’ on this blog post my MP, Ben Gummer, contacted me indicating that he was going to work on the issue and was on-side. Very good news. I used to live in Ipswich and remember the [pedestrianised] town centre as relatively attractive. I owned a car then but used to cycle or walk most places. 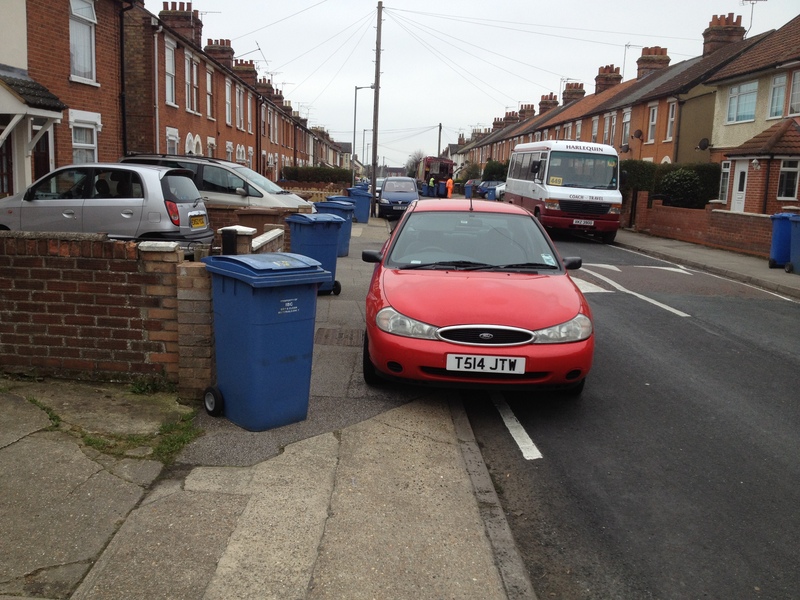 Suburban Ipswich in 2012 looks really ugly in the picture your paint … full of inconsiderate and selfish people. I really hope this issue gets the political attention it deserves, both locally and nationally. Thanks, there are indeed many very beautiful parts of Ipswich with some great walking and cycling opportunities, but clearly there is also an ‘attitude problem’ when it comes to the needs of pedestrians in many residential parts of the town. I hope that I am helping to bring the issue up the agenda! With regards the Tesco driver parking on the footpath whilst he unloaded, your photograph fails to show the opposite side of the road so we are unable to comment as to your claim of it being convenient to park there, however I suspect the driver has parked on that particular side of the road because it was the direction of his travel in order to follow his designated route, for him to have parked on the other side of the road would have meant turning around to facilitate his delivery then for him to turn around a second time to commence in the necessary direction to undertake the following delivery. The trays of shopping being off loaded are often very heavy and the driver may have on some deliveries to walk between his vehicle and the customers kitchen several times, it is therefore reasonable for the driver to park in a place as convenient as possible for him to make the delivery. It is also safer for the driver to avoid having to cross the road carrying his delivery to the customer. The delivery driver I am sure would have taken as shorter time as possible to complete his delivery and would have been appreciative of your patience, indeed I am quite sure he would have moved his vehicle if requested to do so. With regards the driver parking on the footpath, this is very unfortunate however in residential areas were the roads are not especially wide and with motorists double parking or parking only slightly offset it is at times unavoidable and if at all possible the driver would have parked with his vehicle fully on the road rather than partially occupy the footpath as shown in the photography. It would seem to me your just a ‘moaner’ who has no greater problem in life than to make ill considered and unreasonable criticism. I suspect you have something against Tesco and its just any opportunity to make criticism of a very larger employer which pays a great deal of money in taxes to HMRC and provides through its delivery service a very appreciated service to the elderly and disabled. Like most people, we have wheelie-bins, I always ensure they remain within the property line when they are put-out for emptying. Unfortunately, the bin men don’t bother when they return them after emptying them. It is not a matter of ‘not nothing’, amazingly they are required to leave them on the pavement in case they block a driveway and create a risk to motorists or something. Bizarre but true. It’s not hard to put ’em back where they found ’em, blocking a drive or no. I leave my bins in front of my car, on my drive at the curtilege . The Birmingham bin contractor Veolia leaves them on the pavement, but still in front of my car. There’s a grass verge where they could put the bins without blocking either the pavement or the carriageway, but then drivers who park their cars facing against the direction of traffic would complain that they couldn’t open their driver’s door, wouldn’t they? They’d also be prevented from parking with two wheels up on the verge. Temporary placement of an empty bin wouldn’t damage the verge even in wet weather.